Rookie goalkeeper Ross McKnight was the Dixon Park hero when he pulled off two marvellous saves in a penalty shootout, as Ballyclare Comrades edged past Albert Foundry. The scorecard was blank at the end of extra-time in Saturday’s Intermediate Cup quarter-final and it was decided by the dreaded spot-kicks. Seventeen-year-old McKnight, deputising for the ineligible Paddy Flood and Paul Hughes, put the Reds in the driving seat when he saved Foundry’s first and later with the scores tied at 4-4, he denied the Amateur League men again to clinch the 5-4 win. 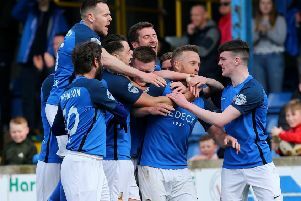 “This game will be remembered for McKnight’s heroics in the penalty shootout, but we had heroes all over the pitch, with everyone pitching in to give 100 per cent and book our place in the semi-final,” said Ballyclare manager, Stephen Hughes. Foundry came to Dixon Park as favourites, having claimed the scalp of two Championship 1 sides, but they found the under-strength Reds a tough nut to crack. With a place in the semi-final at stake, fans had been expecting a thriller, but the players served up a drab affair, with all the drama reserved for the spot-kicks. In the penalty lottery after Gary Brown, Mark Shannon, Chris Trussell and Johnny McClurg had scored, and Andrew Simpson had his effort saved it was 4-4; so the tension mounted as the action moved to sudden death. Michael O’Hanlon nosed Comrades in front with kick 11, and then McKnight pulled off a thrilling save to deny Young. Ballyclare Comrades: McKnight; C Woods, McCullough (Getty 46’), McCart(C), Shannon; O’Hanlon, McClurg, Dobbin (Simpson 61’), Haskins (E Hill 69’), Brown, Trussell. Subs not used: Crowe, K McCauley.